September 05, 2014 features / Encore! EACH ENCORE! COLUMN EXAMINES A PROMINENT FILMMAKER'S BREAKOUT PROJECT AND FIRST FOLLOW-UP FILM, TO SEE HOW BOTH PROJECTS RELATE TO AN EMERGING CAREER. It takes its central premise seriously. It has a sense of humor about itself. These two qualities might seem contradictory, but they prove complementary. If the story didn’t take itself seriously, it would have no emotional weight. But if Johnson didn’t intermittently acknowledge the underlying ridiculousness of a teenager acting like a shamus out of a Dashiell Hammett novel, the inevitable laughs would be unintended. In that respect, a few overtly comic scenes act as a steam valve so the film can go back to the serious business of a contemporary whodunit. Brick has enough of a sense of humor about itself to include a scene where tough-as-nails protagonist Brendan Frye (Joseph Gordon-Levitt) and quietly sinister drug dealer The Pin (Lukas Haas) temporarily put their differences aside to enjoy milk and cookies courtesy of The Pin’s cheerful, clueless mother, in a Leave It To Beaver tableau utterly at odds with the rest of the film. But Brick is also serious enough to expect audiences to be invested in its central mystery, however intentionally difficult it can be to follow. The film’s emotional underpinnings also prove essential. Underneath all the tough-guy banter, anachronistic slang, and alternately dreamy and gritty atmospherics lies a real sense of loss. Brendan is trying to uncover who killed his heroin-addicted ex-girlfriend Emily (Emilie de Ravin), but there’s a sense that he lost her long before she died, when she floated out of his life and into a sinister circle of parasites, addicts, dealers, con artists, and desperate souls eking out a meager existence on the fringes of teenage society. What Brendan is looking for, as much as the killer, is the reason Emily left him, even though he correctly intuits that the answer to that question can only bring him pain, not closure. So while the patter, slang, and dense plotting are innately cinematic, the film revolves around a relatively common emotion: the sense of grief and betrayal we feel when people we love in our youth abandon us to join a clique we don’t understand, identify with, or approve of—when they choose an identity that separates them from us, permanently or temporarily. Johnson has a perfect protagonist in Gordon-Levitt, who is youthful and slight enough to pull off playing a teenager, yet blessed with a wise-beyond-his-years gravity that makes it easy to buy him as a brilliant detective willing to risk everything to get to a painful truth. Johnson and cinematographer Steve Yedlin shoot their star in ways that highlight his solitude and vulnerability. Brendan inhabits a spookily empty world where his only real friend is The Brain (Matt O’Leary), who may just be a figure of Brendan’s imagination, since we never really see him interact with any other characters. Despite Brendan’s obvious strength and intelligence, he seems like a guy who could use a friend, even of the imaginary variety. Like Twin Peaks, which it often resembles tonally as well as thematically, Brick begins with the beautiful corpse of a tragic young woman, then works backward. It’s hard to look at the dreamlike image of Emily’s body at the opening of a tunnel and not think of Twin Peaks’ Laura Palmer wrapped in plastic, lifeless, mysterious, and eternally still. And just as in David Lynch’s cult television landmark, the answer to the central mystery isn’t anywhere near as important as the mood or the journey. Brick is engaging and enjoyable even when it’s hard to follow. There’s a pleasure in getting lost in the film’s world, and Brick remains hypnotic even when it defies complete understanding. Johnson’s 2008 follow-up, The Brothers Bloom, is even more committed to artificiality. It’s about a pair of con-artist brothers who, in the time-honored tradition of con artists, find their commitment to their trade compromised by genuine feelings for their mark. But it’s more about language, storytelling, manipulation, and the almost obscene joy Johnson takes in filmmaking. Here, Johnson seizes upon con-artistry as a sturdy metaphor for storytelling in general, and filmmaking specifically. Johnson’s enormous sympathy and empathy for his title characters might come because he sees their vocations as similar to his own. The con artist’s craft—and The Brothers Bloom is certainly a rapturous love letter to con artistry as a profession and a sacred calling—is fundamentally about manipulating people’s emotions for financial profit, in getting them so emotionally invested in a fictional story that they’re willing to part with their money to be a part of it. Cons invariably work best if the mark secretly wants to be conned, if the con artist appeals to some element of larceny within a mark’s soul, and teases it out until the target hasn’t just been fleeced, but has been implicated for a shaky sense of morality. The same is true of many movies, particularly The Brothers Bloom. Resistance is not futile, but it’s inadvisable. If viewers don’t give themselves over to the film’s multiple layers of artifice and whimsy, and its manipulations and considerable self-love, they’re in for a long, difficult slog. From the beginning, The Brothers Bloom is pitched as a ripping yarn, the kind one veteran sharpie tells another over whiskey and poker. And though Jay’s name is never said, only inferred, it’s instructive that he’s the narrator, given that he isn’t so much an entertainer (the phrase “actor” does not do justice to his astounding and varied gifts) as an American tradition in human form. That tradition is one of card-sharping, magic, and flimflammery in all its myriad guises. Just as Johnson trusted audiences to keep up with Brick’s whip-fast banter and deep slang, Johnson trusts audiences to know who Jay is solely by the cadence of his voice, and to know that for him to praise a con so effusively—even in a fictitious context—it better be one wang-doodle of a scheme. 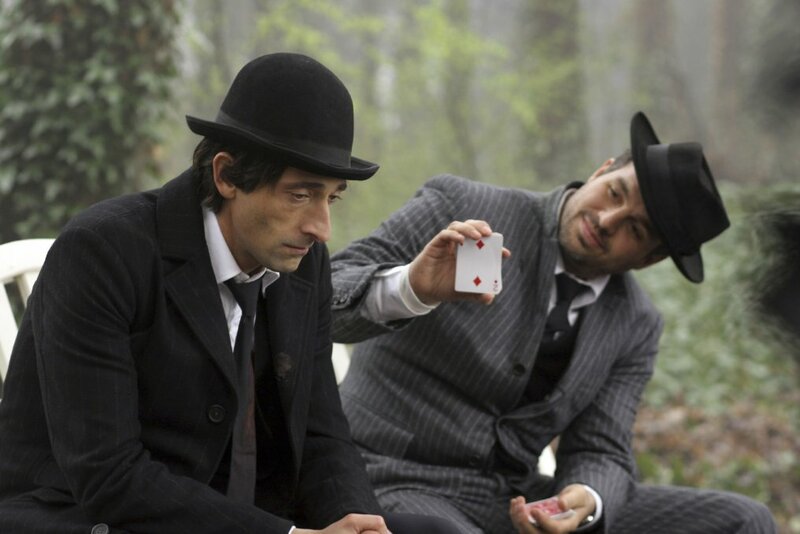 The Brothers Bloom begins with an origin story for brothers Stephen (Mark Ruffalo) and Bloom (Adrien Brody) that posits them as kicked-around orphans who discover their calling as kiddie con artists. In the process, they develop a dynamic that will dominate their adult lives: Bloom is the dreamer and Stephen is the schemer, the imaginative soul who plots the hustles that fatten their pockets at the expense of various rubes and marks. As Jay’s opening narration proclaims, within the brothers’ co-dependency lies its own form of loneliness, as debilitating in its own way as Brendan’s ineffable solitude in Brick. Bloom is doomed to live his life within the strange, artificial contours his brother has created with his lies. He is forever stuck being a mere actor in the never-ending play that constitutes their criminal careers, the Robert De Niro to his brother’s Martin Scorsese. From a genuine place of affection, Stephen has stunted his brother emotionally by taking away his self-determination and free will, and replacing it with a series of roles he must play. Stephen is both the source of Bloom’s happiness and identity—pretending to be who his brother wants him to be is clearly preferable to not having any identity at all—and the greatest inducement against further growth or self-actualization. For Bloom, being his brother’s instrument is a cozy cage, but one he spends the entire film trying to escape. After briskly documenting the boys’ mastery of the fine art of rookery, the film skips ahead decades to the modern day, to catch the gents at the end of what appears to be a long, long grift. Now in “Berlin, 25 Years Later,” Bloom steps in front of a burning staircase that looks unmistakably like a set, and with good reason: Each hustle represents a cross between a play, an elaborate sketch, and an act of performance art. Writing about con artists liberated Johnson from the shackles of realism and verisimilitude. He could create characters whose lives are one big show filled with setpieces, fake deaths, cartoonish accents, and dramatic monologues, because he isn’t writing about normal people, he’s writing about professional pretenders, people who are always on. The Brothers Bloom is even more in love with language, more elegantly composed, and more briskly delivered than Brick, even though two of its leads deliver silent-movie-inspired performances. With his big, soulful brown eyes and bowler hat, Brody is so effortlessly expressive, he almost renders words unnecessary. And Rinko Kikuchi, hot off her Oscar-nominated turn as a mute in Babel, does (almost) wordless work as Bang Bang, the brothers’ collaborator and explosive expert. For as much as Johnson loves words, he also clearly loves what movies can do when ignoring words altogether. The Brothers Bloom takes place in the present day, but its tone and look are so rooted in cinema’s past that references to cell phones almost seem like an accidental anachronism. Stylistically, the film could take place seemingly anywhere from the 1930s to the 1970s. The film’s love interest, the aforementioned Penelope (Rachel Weisz), represents another time-honored cinematic tradition, the daffy screwball heroine who is all dizzy whimsicality and zero common sense. She’s a wealthy heiress, and like all wealthy movie heiresses, her primary preoccupation seems to entail wearing extravagant, elaborate hats with aristocratic élan. The Brothers Bloom shares with Brick a joy of language, storytelling, and the possibilities of film, but tonally, the films are markedly different: Brick is dark and fatalistic where The Brothers Bloom is airy and joyously continental, hopscotching across the globe after Bloom falls in love with his mark and tries to figure out an endgame that will allow him to remain with Penelope without destroying his relationship with a brother who prizes the con above all else. Yet even though The Brothers Bloom is lighter and more whimsical than Brick, it’s similarly rooted in an underlying sense of loneliness and grief that lends the film an emotional resonance, delving past a surface so shiny, it’s almost blinding. Brick, The Brothers Bloom, and Johnson’s third film, Looper, are all elaborate puzzles imbued with deceptive pathos, so it’ll be fascinating to see what the director, that profoundly gifted grown-up prodigy, will do with his next film, the eighth installment in the Star Wars franchise. It boggles the mind that a filmmaker with films as idiosyncratic as The Brothers Bloom and Brick to his name would be given the keys to the most lucrative and talked-about franchise in existence, but over the course of just three films and a smattering of Breaking Bad episodes, Johnson has proved himself a master storyteller. Like the protagonists of The Brothers Bloom, he’s obsessed with telling the best possible story, albeit one purposefully divorced from reality. For Johnson, it’s not about telling a story so well it becomes true, but rather about plunging deeper and deeper into a world of pure fantasy, and taking willing audiences with him.